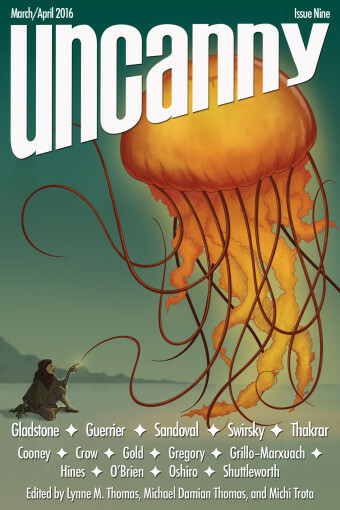 Welcome to Uncanny Magazine Issue Nine! All of the content will be available for purchase as an eBook (PDF, EPUB, MOBI) on March 1, 2016. The free online content will be released in 2 stages—half on March 1, and half on April 5. Featuring all–new short fiction by Rachel Swirsky, Shveta Thakrar, Max Gladstone, Kelly Sandoval, and Simon Guerrier, classic fiction by Daryl Gregory, nonfiction by Jim C. Hines, Kyell Gold, Javier Grillo–Marxuach, and Mark Oshiro, poems by C. S. E. Cooney, Jennifer Crow, and Brandon O’Brien, interviews with Rachel Swirsky and Simon Guerrier, and Katy Shuttleworth’s “Strange Companions” on the cover. Episode 9A (March 1): Editors’ Introduction, Shveta Thakrar’s “The Shadow Collector” (as read by Amal El–Mohtar), C. S. E. Cooney’s “Foxgirl Cycle Song: 1” (as read by Erika Ensign), and an interview with Shveta Thakrar conducted by Deborah Stanish. Episode 9B (April 5): Editors’ Introduction, Max Gladstone’s “Big Thrull and the Askin’ Man” (as read by Heath Miller), Jennifer Crow’s “The Book of Forgetting” (as read by Erika Ensign), and an interview with Max Gladstone conducted by Deborah Stanish. 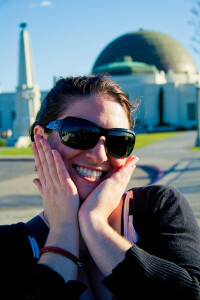 Katy Shuttleworth is a freelance animator, storyboarder, and illustrator. She’s worked on various television shows including the Emmy Award–winning WordGirl. She’s also the cover artist for the ongoing Geek Girl Chronicles series, born from the Hugo Award–winning Chicks Dig Time Lords’ success. When she isn’t animating or drawing, she’s probably painting custom matryoshka dolls. She currently lives in Los Angeles with her two marimos.